As advanced graduate students can attest, attaining a proper work-life balance is a difficult but important skill to master. To be successful in graduate school and be effective in the long run, you need to make time for yourself and stay motivated. There will always be some give-and-take—sometimes work will take precedence over life and vice versa. If you only focus on work for too long, you risk burning yourself out. If you focus on life for too long, well, either you’re not going to be in graduate school very long or you’re going to be on the extended (i.e., 10 year) plan. Like many other graduate students, I have to work to maintain work-life balance. Below are some tips for striking that life-work balance and managing time that I’ve discovered along the way. Find a way to relax and take time to do so! Make time, even if this means blocking out time in your Google Calendar. Setting aside time to relax gives you something to look forward to and a fixed stopping point for whatever you’re working on. A scheduled ending point for a task helps you be more productive during your work times. Some days it may be hard to stop what you are doing mid-project, but I promise it will be there when you get back—just make sure to save it before you step away! It’s good to take a break once a week, too—mental health days are a thing. Don’t feel guilty about taking a day here or there for yourself. When I first started grad school, an advanced graduate student gave me some of the best advice I’ve ever received: take at least one day a week for yourself. No work, just time for yourself. A refreshed and rejuvenated you will probably be more productive anyway. Exercise is an excellent stress reliever and a solid excuse to step away from work and clear your head. Your chair needs a break and your computer won’t miss you. I’m not exaggerating about sleep. Sleep affects your energy level, memory, mood, and attention. Leave the all-nighters for the new parents and undergrads. Do your best to get on a sleep schedule where you go to bed and wake around the same time each day (yes, this includes weekends!). 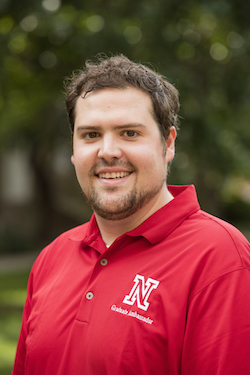 Hear Nebraska uses social media to keep you informed about up-and-coming bands and concerts. I like to characterize Lincoln as a large small-town. It’s large enough that there are activities and things to do, but not so large that you’re in traffic for longer than 30 minutes (except on game days, of course!). Lincoln is a beautiful city. I didn’t grow up experiencing seasons in Texas, so I regard autumn here as particularly gorgeous. The air is brisk, the leaves change colors, and you can sleep with your windows open. Lincoln offers many walking/biking trails that connect various parks throughout the town. These trails make a great network for exploring the city. Don’t have a bike? Rent one from the Outdoor Adventures Center on City campus. Omaha, a short car ride away, boasts more events and activities. Social media's a fantastic way to stay informed of events, including concerts and receptions. 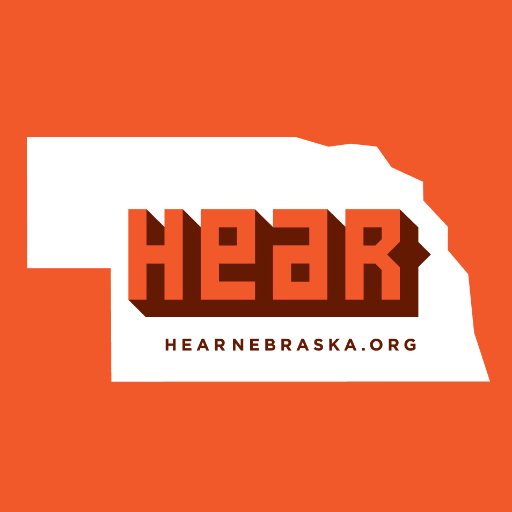 For example, the Facebook pages for Hear Nebraska and the Lincoln Chamber of Commerce feature events in Lincoln and around Nebraska. Interpersonal relationships in your department become the foundation of your professional network. Your colleagues are the people you can call upon when you’re stuck, need feedback, or just want a set of fresh eyes on a project. Not only can such relationships yield ideas and potential collaborations, but these folks are likely your most readily available support system. Most importantly, these folks are the most familiar with your circumstances and experiences. Sometimes you just need to be around new people. People who aren’t in your program are a great resource. When you’re around people who are in the same classes or working on the same projects as you, there’s an inherent temptation to talk about work and all the experiences that you share. Although these relationships are valuable, having friends outside your department (perhaps even outside of academia) is nice because you won’t be tempted to discuss school. Your friends probably don’t care to hear about how many words your wrote that day or the pending conference deadline. People have a natural tendency to define their own status based on how their peers are doing. Using others as a basis for comparison may lead to feeling that you aren’t as good the other students or don’t fit in. This is commonly referred to as “imposter syndrome”, and it’s usually accompanied by a feeling that you somehow snuck in while no one was looking. The truth is, you were selected for a reason. You worked hard to get where you are and you are just as capable as your peers. Perhaps you operate a bit differently, but that doesn’t mean you don’t belong. At the risk of sounding like an after-school special, everyone’s unique. Individuals thrive in different environments and circumstances. Most importantly, everyone has their own set of skills that they bring to the table. Embrace this fact and use it to your advantage. Perhaps your skill set is such that you can generate an idea and plan a project, but the person you are collaborating with is better at writing and synthesizing ideas in a more succinct and coherent way. That said, grad school is a great opportunity to learn new skills, too. Look around you, and see who has skills you admire. Observe what they do and figure out ways to build that skill. In what setting and under what circumstances do you study, write, and concentrate best in? Do you need complete and total quiet? Try one of the secluded areas in one of the libraries. Do you need others to help keep you on track? Find a study/accountability buddy that you can regularly meet with—just make sure they will actually hold you accountable and won’t distract you! If you’re one of those folks that need a TV show or movie on while you work, well you’re on your own there. But chances are good, if you think you can focus on several things at once, you’re only distracting yourself. I thrive in quiet places with minimal distractions, so my basement office works well. However, that can get a bit monotonous and I find it necessary to change scenery from time to time. For example, when it’s nice out, I do my reading outside—the Vitamin D boost I get is glorious. When I need to write, I set up in a coffee shop, pop in some ear buds, and throw on a Spotify Focus playlist. This to-do list includes tasks for the day. 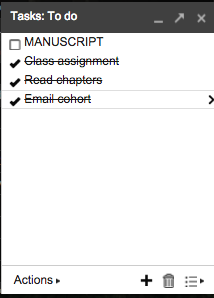 The manuscript gets broken down into smaller, more manageable tasks. I have always been a list person. 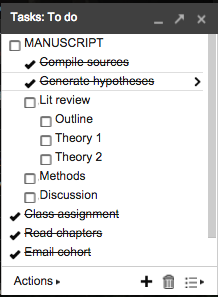 If nothing else, a list reminds me that I have stuff to do and helps me stay on task. At first, a simple list was helpful, but I realized that I was knocking out the smaller tasks and avoiding larger tasks, like writing an article. To avoid this, prioritize items on the list so you tackle the most important items first, not just the easy ones! To take on bigger projects, break down large tasks into more manageable parts. This helps change a mountain back to actual molehill size. This way, checking things off a “to-do” list helps you realize just how much you have accomplished and can help build momentum to tackle bigger projects. Grad school is a time of growth—both professionally and personally. Because you’re so involved in your academic responsibilities, it can be easy to overlook just how much you have accomplished. From time to time, take a minute to reflect on your personal growth and congratulate yourself on what you’ve already achieved. I find it helpful to have events or activities that you can look forward to. So make goals and self-imposed deadlines—then reward yourself for accomplishing those goals. I think it is helpful to do this on both a short-term and long-term basis. Looking forward to the Husker game on Saturday? Use that as your reward for outlining the article you plan to submit to a research journal in four months. Larger events (e.g., concerts, a trip out-of-town, extended break) can serve as benchmarks for larger goals, like the completion of a manuscript (or a chapter of your dissertation). When you’ve met a benchmark, you can enjoy your reward guilt-free. You’ve earned it! 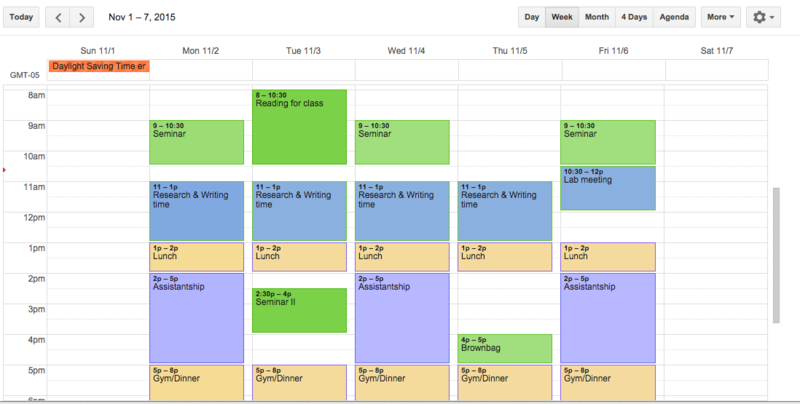 green= class time, blue= research, purple= assistantship/work. If you rely upon deadlines to dictate your plans, you’re constantly playing catch-up. This is a recipe for burnout! Embrace time-management and learn the tools to help you plan for both short and long-term goals. Use tools like Google Calendar to manage your schedule. Using different calendars and colors to correspond to different types of tasks, block out specific times for specific projects (e.g., 1.5 hours of research on a project, 1 hour of data analysis, etc.). Don’t forget to schedule time for yourself! It may sound silly to be so meticulous with your schedule. Trust me—a little strategic planning pays off in the long run! Obviously, this list is not exhaustive and all of my tips may not work for you. But these tips have worked for me… when I implement them. While I wish I had known how to manage my time better early in graduate school, these time management tricks have still helped me greatly. Even if these tips aren’t helpful, I hope they inspire you to come up with your own creative solutions!